Children learn so much more quickly when they are having fun! 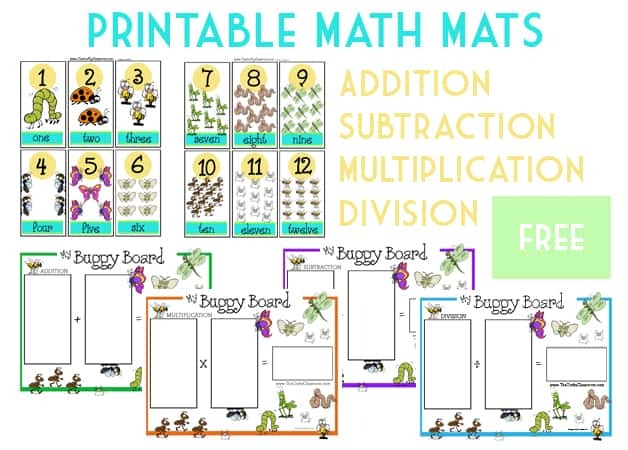 Our Buggy Board Math Mats are designed to add a little bit of hands on activity, and game play while working on key math skills. Children of all ages can play as we have boards for Addition, Subtraction, Multiplication and Division. TIP: It is recommended that you print your game on heavy cardstock paper and/or laminate for durability. Laminating the game also makes it a Dry Erase giving children the option to write in answers. Children use number cards 4-9 and lay them out in front of them. Child lay them out in front of them. Child rolls the die, then must find the correct number card that will make 10 with the die. So if the child rolls a 2, they find their 8 card and turn it over. First child to turn over all cards wins. This is a great game for multiple ages as it’s sorta the luck of the roll. Play make “10” concentration. Print two sets of cards, and use numbers 1-10. Turn all cards over and take turns trying to find pairs that add up to ten. turning over cards into the community pile. If the card before, and the new card can somehow “make ten” then be the first to slap the pile. (i.e. 11-1 can equal 10, 7 + 3 equals 10, and just 10 equals 10) If you are the first to slap the pile, you win the cards. Winner is the one with all the cards in the end. You will need multiple sets of the printable number cards for this to be fun. Roll the die and write in all the numbers. Use the board to preform simple operations during daily math practice. 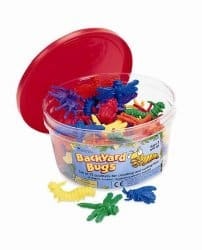 These colorful creepy, crawly counters turn learning early math concepts into fun adventures for kids.Set of 72 includes grasshopper, bumblebee, beetle, spider, dragonfly and caterpillar.Counters come in six colors and are packaged in a reusable plastic tub.Suggested activities included. Also make unique party favors! The link was missing, thank you for the heads up. You can print it by clicking on the graphic or the text link beneath it.